Choosing the best guinea pig carrier is an essential part of taking good care of your sweet pet guinea pig! Unlike humans, who often find traveling exciting and fun, guinea pigs don’t typically like to travel! 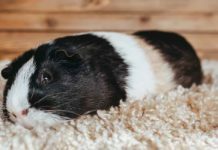 So you have to make sure you do everything possible to minimize anxiety and stress for your cavy during travel, whether you are just headed to the vet for a checkup or you are taking a much longer trip together. In this article, you will learn from guinea pig experts how to choose the safest, most comfortable guinea pig carrier. You will also be able to read a carefully curated selection of the best guinea pig carrier options to help you choose your precious pet’s carrier! One fascinating research study shows marked social and behavioral differences between wild cavies (the domestic guinea pig’s closest living relative) and domestic pet guinea pigs. For example, wild cavies will continue to take risks, explore their territory and seek out new social companions (for mating and breeding) throughout their lives. These behaviors are thought to be necessary for adult cavies, who must constantly balance the need to seek out food and mates with the need to avoid becoming another animal’s dinner! 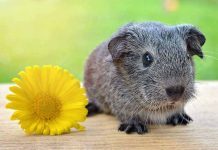 However, once a pet guinea pig grows up (a speedy process that takes just 3 to 4 months), your pet won’t show a drive to explore much or to seek out new companions. Interestingly, researchers think this difference between wild and domestic cavies is due to the domestication process itself. In other words, pet guinea pigs living and breeding in captivity have now so fully adapted to the pet life, which doesn’t require risk-taking and exploration, that they no longer have any drive to do these things. This is also why your pet guinea pig is likely to feel intense anxiety during travel. Travel is a new and novel activity a pet guinea pig doesn’t have any desire to experience! Your job will be to do everything you can to help your pet cavy stay calm and comfy during travel, whether it is around the corner or across the country. You will have several issues to tackle before you can travel successfully and safely with your pet guinea pig. Guinea pigs can look larger than they are because of all their fur. But underneath, your guinea pig’s body is really quite fragile. So, while your first instinct might be to give your piggie some room inside her carrier, the best approach is to get something that allows just enough space to turn around. This is to keep your pig safe if you have sudden stops, air turbulence and other travel unpleasantness. Such events could cause your piggie to slide about and be injured inside the travel carrier. A good size for two adult guinea pigs is 12”W x 19”L x 12”H. Cat or kitten carriers can also work well if you are having trouble finding carriers specifically designed for guinea pigs. Even with bedding and hay inside the carrier, you can expect your guinea pig to do some bathrooming out of anxiety. So you want to choose a carrier that will be easy to clean and sanitize. It may feel tempting to get a soft-sided guinea pig carrier for travel. They just look and feel more homey! However, for some types of travel, hard-sided carriers are safer. They also tend to be easier to clean and sanitize. While it is important to protect your cavies from drafts, ventilation is equally important. You want to be sure they are getting fresh air inside the travel carrier. So choosing carriers that have built-in ventilation at the sides and top for airflow is key. Your guinea pig will not want to look out the window or take in the view during travel. He will want to hide! Guinea pig experts recommend putting down a layer of puppy pads or some other absorbent layer at the bottom of the travel carrier. Then add in a small handful of hay. If your guinea pig has a favorite hiding cave or cozy for hiding, include that as well. Be sure the items you place inside don’t block ventilation and airflow inside the carrier. Otherwise, your guinea pig could overheat! Guinea pigs do best when the temperature in their environment remains between 65-75 degrees Fahrenheit (18.33-23.88 degrees Celsius). Guinea pigs can’t sweat to cool themselves and their natural resting body temperature is around 99-103.1 degrees Fahrenheit (37.2-39.5 degrees Celsius). So your piggie will need your help to stay comfortable during travel! Temperature during travel can fluctuate quite a bit, especially during car travel. You will need to make sure your guinea pig’s environment stays as stable as possible. This can include placing the guinea pig carrier out of the path of direct sunlight, drafts, air conditioning or heating vents and other variable elements. You may not always be able to fully control the weather or temperature during travel with your guinea pig. And it can quickly become messy to use a travel water bottle inside your pig’s tiny travel carrier. Here are some tips to help your guinea pig stay healthy in variable temperatures. Bring a blanket that can fit completely over your guinea pig carrier for insulation against cold and drafts. Bring water-rich veggie treats like cucumber, dark leafy greens and apples. Freeze a bottle of water, put it inside a sock, and strap it inside in one corner of the guinea pig carrier. It can be surprisingly challenging to juggle carrying your guinea pig carrier along with luggage, handbag and other items! You will want to find a way to carry your guinea pig travel cage securely in a stable, upright position as much as possible. Some guinea pig travel bag products may come with a shoulder strap or backpack-style straps to make carrying your guinea pig easier. Why use a guinea pig carrier? It is possible to make your own makeshift guinea pig pet carrier. But this is typically not in your pet’s best interests. For example, cardboard or plastic boxes, handbags, wire cages or buckets are all just accidents waiting to happen. You should never carry your guinea pig in your arms or on your lap. This will not only cause intense anxiety for your cavy, but the risk of escape or injury is just too great. A guinea pig carrier that is specifically constructed to keep small, vulnerable pets safe during travel and transport is the hands-down best way to minimize stress, anxiety and the potential for injury when you are traveling with your guinea pig. 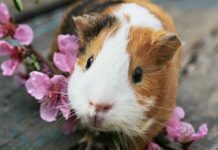 Let’s explore some different types of guinea pig carrier so you can decide which carrier type will work best for your travel plans with your pet! Hard-sided pet carriers are the hands-down safest type of guinea pig carrier to use. The solid, rigid sides offer the most protection for your cavy in all the situations you can think of and those you can’t think of. This carrier is a good choice for a single adult guinea pig. It measures 9.1”W x 11.8”L x 8.3”H. There is 360 degrees of ventilation along the top and upper sides. The top and bottom snap apart to make cleaning a breeze. It has a set of roomy carry handles and the door is on the top. This versatile hard-sided carry crate is suitable in size for two adult guinea pigs. The dimensions are 19.5”W x 12”L x 11.5”H. There are two doors – a top door and a side door. The carrier features 360 ventilation at the top and sides and a carry handle. Screws that can be used to secure top to bottom for extra security. Otherwise, the bottom and top snap apart for easy cleaning. This solid-sided, well ventilated cat carrier measures 15.2”W x 18.5”L x 14.2”H, making it suitable for one or two adult guinea pigs. The carrier fits together and comes apart using a series of latches, making it easy to clean and fold up flat for storage. You can order it with or without the optional Sherpa bed. If you are planning to fly with your guinea pig, always check with the airline prior to departure to be sure your carrier (and your guinea pig!) are approved for flight. Even if a brand states its carrier is “airline approved,” like these airline guinea pig carrier options, you’ll want to double-check. This is the smallest size Sky Kennel, measuring 21”W x 15”L x 16”H. It is suitable for one or two guinea pigs. It features side ventilation and a side door with a travel handle. The hard sides make it a secure and safe travel option. 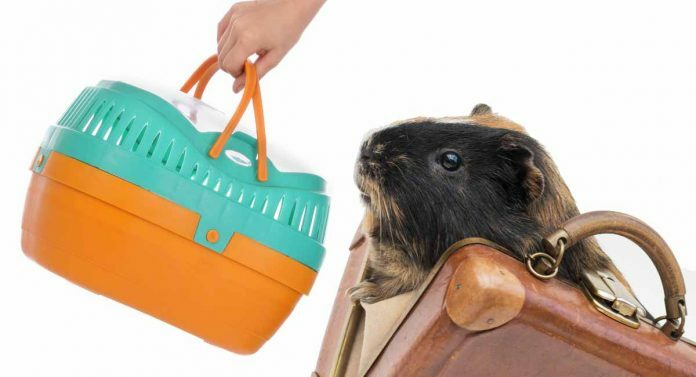 This backpack-style airline approved travel carrier comes in four sizes so you can choose the size that matches the number of guinea pigs that will be traveling. It comes in navy blue and is well ventilated with a side pocket and side ventilation. Doors are at the top and side. This purse-style airline-approved soft-sided pet carrier measures 17.5”W x 11”L x 11.4”H. It features secure zipper-clip locks, a carry handle and optional shoulder strap, side ventilation and top and side door. It also comes with a free treat bowl. A true sling carrier might not be a good choice for a fragile guinea pig, who could be too easily crushed in crowded or close situations. However, if you are looking for a sling or back-style carrier to free up your hands during travel, these guinea pig carrier sling style options might work well! This carrier has two sizes (both in grey/yellow/black). The first measures 16”W x 10“L x 13”H and the second measures 17.3”W x 10”L x 13.6”H. Both feature a top “skylight” mesh compartment that provides extra ventilation in addition to the ventilating holes along the sides. The carrier is a backpack-style to leave your hands free during travel. A small pocket rests along one side to store items. The carrier has two doors – one on the top back and one along the side. There is also a chest strap and a waist strap for a more secure fit. This pet carrier backpack measures 12.5”W x 10.2”L x 16.3”H. It features a door at the side and another at the top. The shoulders are padded and the backpack comes with a chest strap and a waist strap for more secure fit. There is a front pocket and a side mesh pocket. It comes with a small water/treat cup and you can choose from 9 colors. This soft-sided guinea pig bag carrier is suitable for one adult guinea pig for shorter trips. It measures 16”W x 9”L x 9”H and has ventilation on all four sides. The carrier zips apart and has a side entry zippered door. One nice feature about this carrier, if you don’t travel much with your piggie, is that it can fold down flat for storage. It has a handle and optional shoulder strap. We hope you have found this guinea pig carrier article helpful to select a safe, sturdy, comforting carrier for your precious piggie! When you do select your pet’s carrier, please drop us a comment to let us know which one you chose! Dray, T. (2017). How to Travel on a Plane With a Guinea Pig. USA Today. Potsus, W. (2016). Travel Carriers. CT Guinea Pig Rescue. Bannerman, S. (2018). Guinea Pigs: Transport. Animals in Schools. Quesenberry, K. (2018). Breeding and Reproduction of Guinea Pigs. Merck Veterinary Manual. Robinson, L. (2018). Guinea Pig Husbandry. i20 Veterinary Hospital. Vanderlip, S. (2015). The Guinea Pig Handbook. Barron’s Educational Series. Zipser, B. et al (2014). Effects of domestication on biobehavioural profiles: a comparison of domestic guinea pigs and wild cavies from early to late adolescence. Frontiers in Zoology, 11(30).